"Shaun asked very thoughtful and inspiring questions during our consultation. He made me feel very valued and most importantly, I saw that my business and its success meant something to him." "Shaun Friesen is a true professional in every sense of the word; one of the few out there with the insight, versatility and thoughtfulness to create explosive and transcendental designs." "We recently had the opportunity to work with Soulfire Design, and we're beyond pleased with our fresh new website. It's simple, effective, and a touchstone for our community. Shaun is reliable, artistic and insightful: technical mystery becomes clear, complex ideas become simple, and dreams become reality… Fast!" “My website has been completely revamped and I have Shaun Friesen to thank for my new look. He is patient, creative and has a knack for understanding the essence of your business and taking it all the way to the finish line! There was not a single technical glitch. I highly recommend him as a creative director." "I am quite particular when it comes to bringing non-First Nations people onto very sensitive projects and Shaun has demonstrated a deep respect for the First Nations peoples. I feel he's truly committed to the important mission of IndigenEYEZ: community empowerment & decolonization." 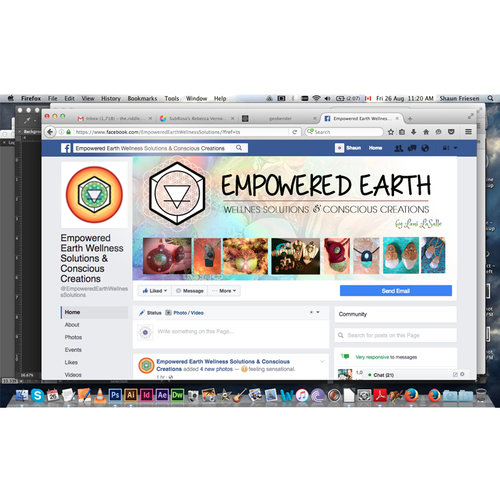 "Soulfire Design has helped uplift my regional ecological education practice to a global level. I highly recommend their creative and technical support to anyone who wants to upgrade their project or business. Flexible service, timely delivery, world class quality." "Our large format project was very complex and the user-friendly design elements that Shaun created for us were crucial to its success. He grasped the concepts quickly and really caught the spirit of the work. His designs helped us realize our vision perfectly." "We never could have imagined the amazing garden sign that Shaun designed for us. It is clear, colourful, vibrant, and represents our vision, mission, and the culture of community we want to create. We would highly recommend Shaun for any design or creative needs." "Shaun has done an amazing job of creating a unique and recognizable visual style for IndigenEYEZ. Shaun is a team player with the flexibility to respond to evolving situations. He’s creative, motivated, dependable, and an absolute pleasure to work with." An artisan of the modern era. "Shaun Friesen is a true artisan of the modern era. His skill-set encompasses an excellent working knowledge of digital media technology, enabling him to clearly and creatively express his talent and artistic imagination in the realm of binary phantasm."